The ‘Little Black Dress’ of roast chicken recipes | WTF Do I Eat Tonight? It is a truth universally acknowledged that, at some point during the year, usually at Christmas, most women’s magazines will mention the need for, and the delight of a LBD, aka as a ‘Little Black Dress’. Though the repetition of the story is a bit annoying, there is plenty of truth in it. There are some outfits that you can wear and know exactly how you will look and how you will feel: they are reliable, consistent and easy. I have two, a posh and a less posh, both black though they don’t have to be and, yes, whenever I am stumped and, to a certain degree, whenever I need reassurance, I wear them. They never fail. And this, dear follower, is the culinary equivalent, at least for chicken-eaters. You will never want for another roast chicken recipe again, or for something to make on a weeknight whether for yourself (I am that greedy), your family or because you have friends coming round and no time to cook. This is, like an LBD (not sure why I need ‘an’ there but I do), reliable, consistent and elegant. And fast and simple and gorgeous. It is one-pot, requires only four ingredients apart from store-cupboard essentials and takes, at the most, an hour. I could go on, but I won’t since a post about this needs to be as quick and neat as the recipe. Deb Perelman has, again, created something that I will make on repeat. So far I have cooked it four times and the only thing I’ve changed about it on each occasion, apart from the American measurements, is the type of potatoes. I have made it with main-crop (quartered into small, equal-sized pieces), Charlottes (peeled, and cut into equal-sized small pieces), baby new potatoes (left whole and peeled) and, finally, baby new potatoes left whole and unpeeled. The last, the laziest, was on a Wednesday after work when I had an hour to cook a main course, a dessert and make a salad and neither the time nor the inclination to peel the potatoes. And, you know what, those potatoes were the best yet. Technically this serves four but I usually devour it, with some chicken left over, with just one other person. It’s lovely as it is, even better with a few cloves of unpeeled garlic thrown in with the potatoes and, at most, it requires a green salad to gild it. You’ll be wearing this a lot, I promise you. Makes enough for two greedy people with leftovers, or for four more abstemious types. 1. Preheat the oven to 230°C/210°C fan-assisted/gas 8. Ugly, but simple and necessary. 3. Put the chicken breast-side down into a roasting tin, season the cavity with salt and pepper then turn it over, pat the breast dry with some kitchen paper and season that too. 4. Prep the potatoes as required (so peel them if you want, cut them all into equal-sized pieces if necessary) then put them all round the chicken. Dot the potatoes with butter and/or drizzle with oil (you don’t need to put fat on the chicken), season then put into the oven. 5. Put a timer on for 20 minutes and, when the time’s up, remove the roasting tin from the oven, turn the potatoes and return to the oven for another 20 minutes. 6. Whilst the chicken is cooking, juice the lemon, remove the leaves from the thyme stalks and discard the stalks..
7. 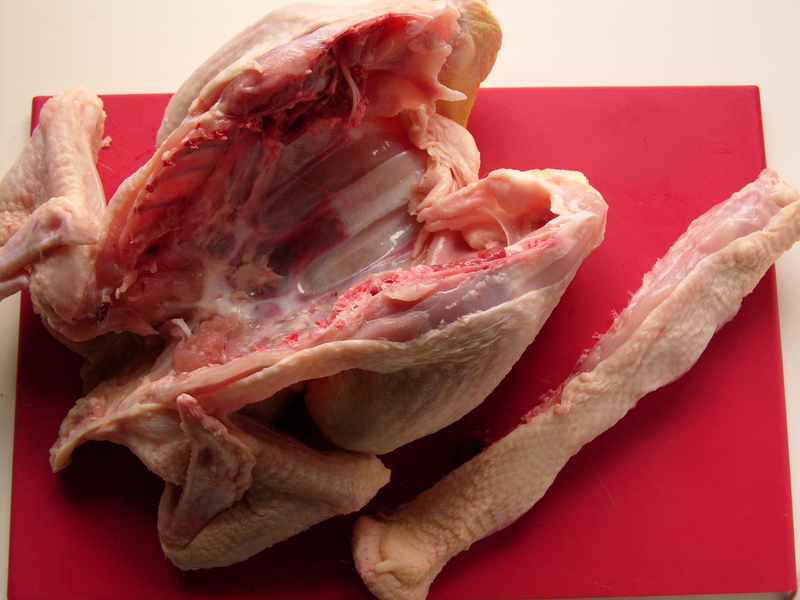 After 40 minutes, check whether the chicken is cooked (stick a skewer or knife into the fattest part of the thigh; the juices should run clear without a trace of pink). Return it to the oven if it needs a little longer but, if the potatoes are done before the chicken (this has happened to me twice) cover the whole lot with foil before returning it to the oven to prevent the potatoes getting too cooked. 8. Once the chicken is done, remove it from the oven, pour over the lemon juice, sprinkle over the thyme leaves, chop the chicken into 4 rough quarters and serve with the potatoes. This entry was posted in Chicken recipes, One pot, The Smitten Kitchen Cookbook, Wheat-free and tagged Deb Perelman, roast chicken recipes. Bookmark the permalink. Yum! Made it twice now – really was finger licking good. First time I couldnt work out which bit was the backbone (shamefull really) and cut the breastbone out by accident – still tasted delicious though. Love that recipe. MUST post the perfect spinach recipe to go with it. And you’re so welcome. Not got much time for Looping right now but hopefully see you soon for a drink or more food!